It is 8:28 AM and there are a mass of people all waiting rather impatiently for the sky rise elevator doors to open. 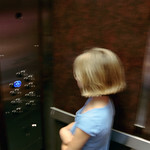 Finally, the elevator arrives at the Ground Floor Level and the doors slowly open. I quickly enter with purpose and strategically position myself in the back corner of the elevator after appearing to nonchalantly press the illuminated number 39 button. After disguising my external and gleeful anticipation, I then surreptitiously prepare myself mentally for the long ride to my lofty office floor destination. Some people could be rather bored with the time taken for their vertical ride to tediously meander up to the 39th Floor after continually stopping at many interim floors along the way, but not me! This time is precious as it allows all elevator participants some brilliant people observation and study opportunities! If you haven’t seized the chance to really look at your fellow elevator incumbents, then you really haven’t lived as it contains a microcosm of creativity! This creativity is quite personal and exhibits itself in many public and rather clandestine forms. The joy for the watcher is in the identification and discovery process which may be rather transparent to those who do not appreciate the visual and sensory clues that are being portrayed within this closed people transportation cubicle. In case you don’t know what I’m talking about, let me provide some additional information so you too can ponder this creative and informative elevator experience. Firstly, let’s talk woft. Yes, woft. First thing in the morning, your fellow workers will apply a variety of personal fragrances, with fluctuating levels of intensity, to all parts of their body. These fragrant wofts go under the common names of perfumes, aftershaves, moisturisers, hair gels, deodorants and other secret body embellishments. To add to the mix, there are also those people that don’t believe in fragrance enhancement in any form, shape or application. The result is a composite array of woft that frequently changes in line with the differing elevator assortment of occupants. Then there are the clothes. There will be a jumble of suits, skirts, dresses, shorts, jeans, ties, scarves, socks, shoes and even the occasional sporty look. The colours embedded into these fabrics will generally cover the full spectrum range of the PMS colour palette (except for some strange reason in Melbourne where the colour dark grey or black seems to dominate). Once again, each elevator ride up and down the building will have its own unique colour and clothing dominance. And yes, the elevator also provides a fool-proof tool for evaluating whether someone is an introvert or an extrovert. Your classic introvert will typically stand up against the elevator wall, look down at the floor and say absolutely nothing. Whereas, your flamboyant extrovert will tend to position themselves within the central people mix and their eyes will be continually darting around looking for a fellow extrovert to initiate a meaningful, typically loud and engaging conversation. Now should you encounter a whistler in the elevator, this usually signifies a frustrated extrovert who just can’t refrain from communication any longer and is about to socially and verbally explode! I know what you are now about to ask! What about the mobile phone user? Well, there is no benefit achieved by studying these elevator travellers, yes, none at all. Why? Because these people are fundamentally rude and are therefore insignificant and irrelevant from a creative and academic perspective. However, there is a solution. One option is to construct an elevator that is impervious to mobile phone reception (which is quite a common occurrence with the mobile network my company uses). The other, and more economically acceptable option, is to have an inbuilt sensor within the elevator that initiates a torrent of polite verbal abuse telling the person to desist immediately. I was going to suggest some choice descriptive expletives, but as all elevators carry a “G Rating”, this idea just wouldn’t pass the globally accepted standards of elevator etiquette. So, if you are in the business of corporate change management, HR or team building, an inexpensive and unique “room of study” awaits you, that being your elevator. Next time you take a vertical ride with your colleagues, may I suggest you ponder the woft, the clothes and observe any introvert or extrovert tendencies. I’m sure that many innovative learnings will be presented for your benefit! Love your elevator observations! I frequently indulge in same, in between managing my fears of getting stuck. And the worst woft? Those coming back from the smokers’ corner. Yuck! I know what you mean about those smokers! Maybe the elevator message could be modified to target cigarette woft? Thanks Liz. I would welcome your US observation feedback….now that’s a thought, I just wonder if any cultural elevator differences will prevail? I can see a PhD study looming with this one!